Danny Schwarz was born in Croydon, United Kingdom, on January 28, 1987, is a English male model and actor. 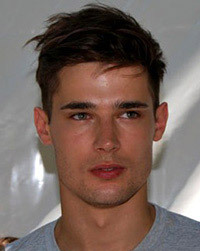 He began his modeling career in 2008, signed with modeling agency Premier Model Management. Friends with male model Sean O'Pry. Danny's favorite movies are Into the Wild (2007) and The Matrix (1999). He made his acting debut in short drama film Throw (2016) in role as Cole. He played Fred in TV series Prillen Short Shorts in episode Dudes (2017). Flaunt, W Magazine, GQ Style Korea, August Man Malaysia, CLIENT, Details, Acne Paper, The Ministry, Vogue Paris, Abercrombie & Fitch, V Man, Robb Report, GQ Magazine U.S., 10 Men, Out Magazine, Contributing Editor, Surface Magazine. Walked runway for Todd Snyder, Nautica, Banana Republic, Dirk Bikkembergs, Hugo Boss, Calvin Klein. Mavi, Tommy Hilfiger, Louis Vuitton, Ralph Lauren, Philippe Matignon Swimwear, Massimo Dutti, House of Fraser, American Eagle, Colcci, Heyu, Barneys, Armani Jeans, D&G, Pepe Jeans, Calvin Klein Jeans, Missoni. Represented by agencies VNY Model Management New York, d'management group Milan. I go to the gym five times a week and also do boxing and football. In New York I built a new life with new people, new family away from home. I was into music from a very young age, growing up in the south of London. I didn't see myself as a pretty boy, earning the kind of money I could only dream about in the music days. I'm still very humble and shy. Back home I have a Ducati and Kawasaki. I love to clean and fix it and I love to snowboard.